My daughter and I are having a contest to see who can “sell the most used stuff on Ebay”. This came about because we have a friend, Tena, who is making $2,000 a month extra income, finding “stuff” and shipping it out to people who want said stuff. Tena hired my daughter to take pictures of her items and now we are hooked. We are trying to figure out what to sell and how to sell it. This is super fun for me because it definitely is having a “startup” feeling to it. While I work with people starting their businesses from scratch often, it has been a very long time since I have have started my business from the dead stop of being a startup. This post is less about “what I would do if I was just starting out now” which seems like a cop-out considering I really don’t know what I would do, and more about making smart marketing choices when you are a startup so that you can have the most impact possible fast out of the gate. 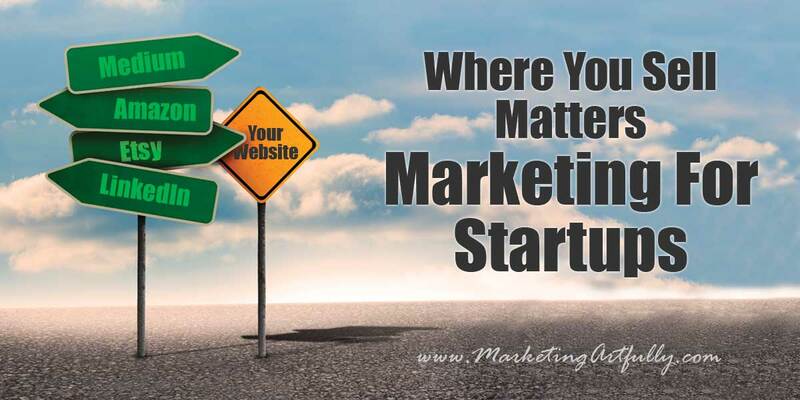 If you are a startup selling a product, chances are your website is not a hotbed of activity YET (now this is not to say that it will never be, but building a business plan on getting or paying for web traffic is going to take some time or money to accomplish). With that in mind, I think it would be great to check out places that you can find to sell your product or service where there are already eyeballs. Bonus: The cool thing about this is that you can “test out” your ideas and concepts here without building a huge platform or massive content. A little of that “try often and fail fast mentality”. I have to say that I just did this. I worked in manufacturing years ago and know what I am doing, but it is not a first love. That said, I did launch a couple of products and got a couple of RFQs in. Doing it that way allowed me to see that this is not my path WITHOUT building something huge and taking months of effort on something that will eventually peter out anyways. Of course I can’t give you every example under the sun, but I can try and point you in the right direction or at least get your thinking headed that way! If you are thinking about selling a course on your website and you have the same kind of traffic I do (about 15,000-20,000 hits a month or less), I would recommend that you post your course on Udemy instead. This is a site that is dedicated to providing training from a whole host of different people. According to Alexa, a company that monitors website traffic, Udemy ranks 829 in the world for website traffic (634 in the US). Considering my site is ranked 67,006 in the US, there is a very strong possiblility that any course I would sell would get much more exposure if listed on Udemy than if I just try to sell it from my website! One thing that has become very clear as we have researched what to sell on which site is that Ebay is much better for certain types of products. If you have a lot of new something or others, list it on Ebay. But if you are trying to sell vintage dress patterns, you might be better off to hit the Etsy store. I am not saying that you should take your products or services and throw them up against the wall to see what will stick. Instead you need to really research the sites that you are considering using and then make sure your product or service is a good match for their users. A little time spent on this step might make a huge difference in your success rate down the line! It is weird how little information sells for on Amazon. Many of my clients have $97 Ebooks that are truly a value for the specialized information they are teaching their readers, but that kind of price point freaks Amazon out. Most books are listed on Amazon between $0.99-19.99 with just a smattering over that price point. When you are considering whether to use Amazon at this point, instead you should be selling a digital ebook that is a much lower price and then have “funnels” set up in place to move them from your $.99 ebook over to your $100 offering. Part of know where you are selling is whether the price point you have to adhere to will allow you to feed your family. While Amazon is an amazing marketplace for books, you have to sell A LOT of them to make enough money to survive and thrive. Last but not least let’s look at where you are posting your content. On your website is great of course, but if you do not have a huge readership yet, you might want to consider posting some of your words as guest posts on other people sites. Yeah, I know you hear that a lot, just guest post, but what if no one will give you a chance? Then you need to start out by providing your own “guest posting” opporutuiies by publishing on LinkedIn or even Medium.com which both allow you to set up accounts and say whatever you want for free! My husband is programmer and so we get to see a lot of messed up things. And then sometimes I do them myself. I found the really cool program that makes the little links to resources (like below). I went to Johnny all happy and asked if he could make that for me and BAM..totally shut down. He said it would take several hundred, if not a thousand hours to build that same product that I can buy for $5 a month. Maybe it is because I have that immediate feedback loop, but I always try and start with something that is off the shelf for my marketing before thinking that I have to reinvent the wheel. I know it is isn’t perfect sometimes, but anytime you can use an established platform that already has momentum, I have to think that is the best place to start and test everything first.